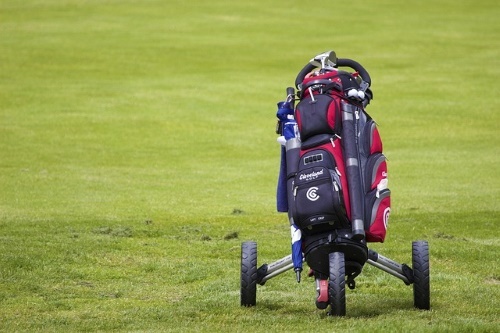 There are a number of different training aids out there, each one for different problems golfers face. Even experts use training aids to help them improve their game, but with the huge selection out there, it can be tough to figure out what works well and what is a waste of money. Every training aid is going to help someone, and we want to to help you identify what training aid you need and how to find the best version of it for you. We have detailed what you should be looking for and what to avoid in the best golf training aids, and now we want to show you a few of the top picks for this category of golfing gear. Hopefully, one of them will prove to be something that you can use to improve your golf game. This simple rod set is excellent at helping you improve your stance. You simply arrange the rods according to the directions and use them to ensure your stance is correct. They push into the ground easily thanks to their pointed ends, and the colorful design makes them instantly appealing. The price isn’t too steep either, giving them some decent value for those golfers who are struggling to maintain the correct stance as they swing. Good value for what you’re given. Simple and effective stand correction. May be too simple for some players’ tastes. This trainer attaches quickly and simply to your irons, allowing you to improve your swing and ensure you hit at the right angle. It may take a bit of practice to figure out how to use it most effectively, and it will be awkward at first to play with this attached to your irons. However, it is practically weightless, and it can produce incredible improvement in the way you swing. You can use this to train for both club path and swing control. 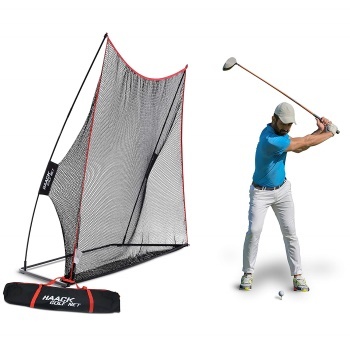 If you are hitting the ball too far or inaccurately, then this trainer can improve your game and ensure you hit the ball where you want it every time. To set it up, you just attach the two pieces to your club and tighten as necessary, once you figure out exactly how tight they need to be and where they should be located on the club. A very simple to use training tool. Can take some time to get used to. One of the more expensive training tools. With this training aid, you can get your arms and body working together in synchronous movement. You’ll be able to swing more accurately and ensure that your stance is correct while you play. If you are really struggling to hit accurately and to get your swing to feel natural, then this training tool is for you. It’s actually cheaper than many of the competing swing training tools, so it’s a good option for golfers who are still not sure exactly what kind of swing problem they may be having. The product is incredibly basic and is also simple to use, so you may balk at paying close to $50 for what amounts to a few simple items, but it is very effective at what it does. Effective at improving your swing. Very easy to learn to use. Helps coordinate your swing and stance. Kind of costly for what is included. This is one of the more affordably priced ball return nets. It catches the ball for you and sends it back without you having to go after the ball or wait a while between shots. It’s a great way to ensure that your aim improves, cutting down on a lot of the frustration for you and helping you to make more accurate shots. Affordable pricing for what’s provided. May not last very long. This may not be the easiest training tool to use, especially since the instructions offer limited help, but it is one of the most effective. Once you get used to how to operate it, you can greatly benefit from the instantaneous feedback. It is also well constructed; so it should hold up for a very long time and provide you with plenty of value for your money. This swing trainer is more robust than most, and it will cost more than most, but the benefits it offers will be well worth the added cost. Every training aid has its purpose, and you just need to figure out what one or ones would most benefit you. 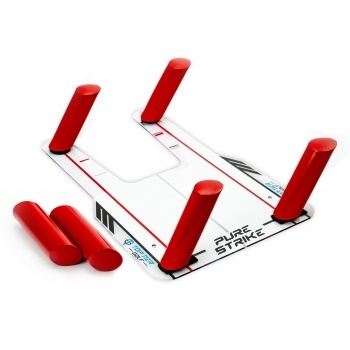 If you are someone who struggles to make par or who has a tough time getting the ball to go where it is supposed to, then training aids can help you. To what degree they can help you ultimately depends on you. A lot of people struggle to get much benefit out of the aids, but the problem isn’t with the aids themselves, in most cases. The problem lies in the way the player uses the aid or in the kind of aid that was purchased. We’re going to get into how you can choose the right kind of aid, but we do want to stress that using the aid the way it is intended to be used can make a huge difference. The impact on your game can be incredible. Most people take a long time to improve their game, especially if they are causal golfers. But using a training aid and using it well can quickly boost your ability and help you play better. You’ll make fewer mistakes and be able to hit like the pros quicker than you think. Nothing improves your game as quickly and as effectively as the best golf training aids. 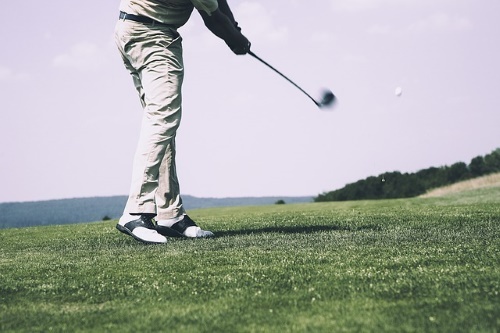 Buy for Yourself– Just because a notable golfing figure used a training aid that helped him or her, that doesn’t mean you will benefit from the same training aid. What works for one person may not work well for another, and you need to realize that your needs are particular to you. Buy the training aid that is made for your particular problem and you will see results appear much faster than if you put less thought into this process. Choose the Right Format– Whether you are working on your golf swing or improving your stance, you need to find a training aid format that works well for you. According to GolfSwingRightNow.com, you will have to choose between a training video, a book or a physical aid. These three all have their pros and cons, but ultimately, you need to decide for yourself what kind of training aid you will do best with. Some people are visual learners, while others are tactile learners and others do just fine with a book to glean their information from. If you try one format and you are not getting the help you need, don’t think the tools or training method are at fault when it could just be the format. Value– You’ll want to read some reviews before you buy any training aids to ensure that they are working for people. If you read a couple of bad reviews in a sea of positive ones, then that’s no real indication that the product is faulty. But look out for products with numerous bad reviews and no very positive ones. Those are ones you should avoid, and you should be looking for an alternative. Price– You also want to consider the cost of the training aids aid if there is a similar product that costs less. There is a huge market for these items out there, and the best golf training aids don’t have to be prohibitively expensive. You can find some good training aids at a good price if you compare the costs and read reviews before buying. 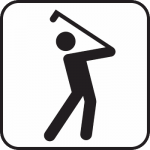 Buying for the Wrong Swing Error- There are many different kinds of swing errors, and according to Golf Advisor, if you buy a training aid for a golfing swing error that you do not have, then you won’t be getting any help. You have to identify your particular error before you can buy the appropriate training aid. Buying a Lot of Aids at Once- You need to focus on one problem at a time and one way to deal with the problem. If you buy too many training aids, particularly several aids for a single issue, then you are going to get confused and not get as much help as you are hoping for. Aids with No Guarantee– If you want a training aid that will last you and that the manufacturer stands behind, then be sure to look for some sort of warranty or guarantee. Its easy to fall for the trap of buying something just because of glowing reviews or a good price, but if there is no manufacturer warranty or similar protection, then you are going to end up regretting your decision when the training aid offers you nothing worthwhile or fails on you. Settling for Subpar Training Aids– You may not expect to play at a professional level at any point in your life, but that is no reason to buy shoddy or ineffective training aids. According to Gulf Range, you should be looking for training aids that will challenge you and will help you achieve perfection in your golfing. 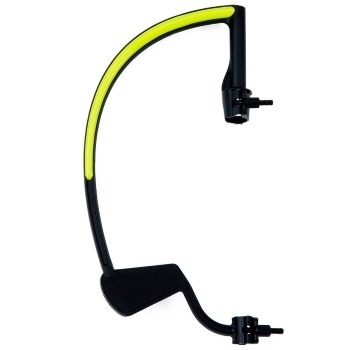 Did you find a training aid that stood out to you as something that could be helpful for your golf game? We certainly hope so, but even if you did not, you can still use the information in this buying guide to help you find the right training aid for your needs. 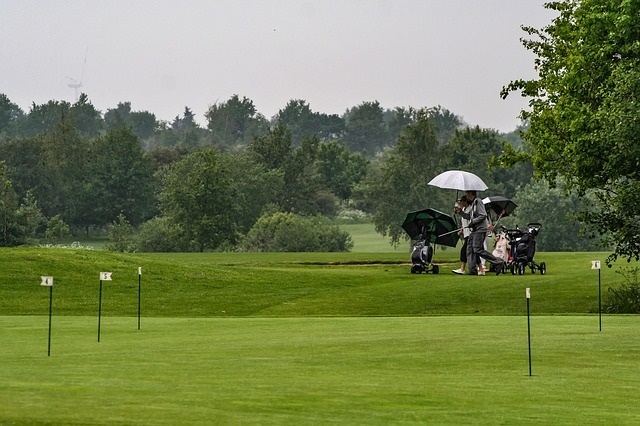 Remember that each golfer is different, and the things they need help with are often different as well, so you’ll have to make sure that you get the right training aid for your particular difficulty.